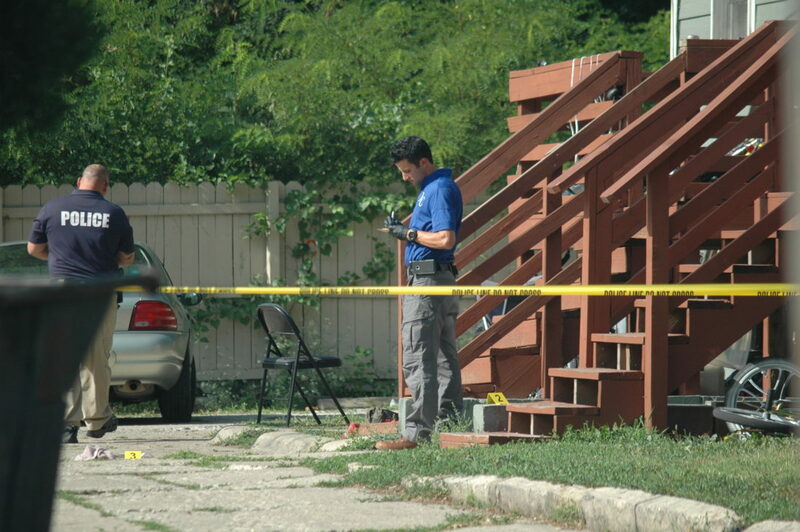 Lawrence police investigate the scene of a double shooting at 713 W. 25th St. the morning of Tuesday, July 3, 2018. The shooting occurred the previous night, leaving one man and one woman with life-threatening injuries. Marzetta Yarbrough carries a thick, inches-long scar on her left cheek, and another smaller scar near it. The same shooting on July 2 at 713 W. 25th St. also left Jeremy Jones with outwardly visible permanent injury. Jones now uses a wheelchair. A bullet hit his left side and traveled nearly all the way through his body, damaging his spinal cord and leaving him a paraplegic on its way, his girlfriend testified. 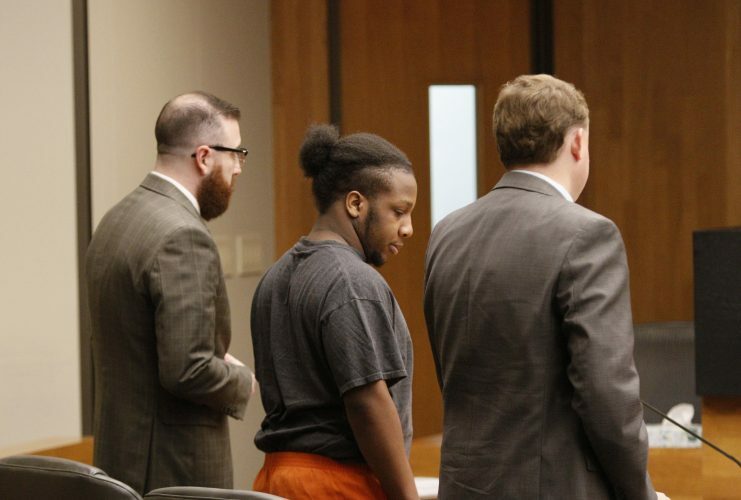 Both victims appeared in Douglas County District Court on Tuesday during the first day of a preliminary hearing for the man charged with shooting them, 59-year-old Lawrence resident Tommy J. May. Also testifying was the Lawrence police sergeant who chased May after the shootings and fired 18 rounds at him — before, during and after the suspect rammed the sergeant with his car. The sergeant’s dash-cam video and audio recordings of the violent confrontation were played in court. Judge James McCabria scheduled the remainder of May’s preliminary hearing for Oct. 25. Then the judge will decide whether to bind May over for trial and on what charges. May currently is charged with attempted first-degree murder, attempted second-degree murder and felon in possession of a firearm in connection with the shootings of Yarbrough and Jones. The Douglas County District Attorney’s Office has said prosecutors will ask for more charges from May’s alleged attack on the sergeant. 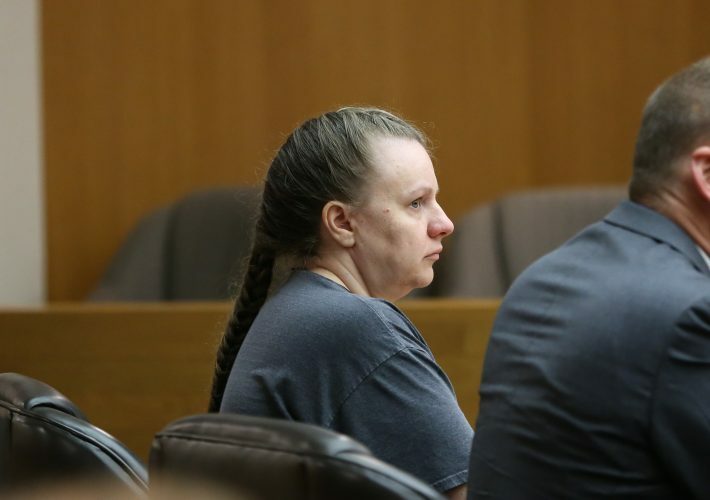 After May pistol-whipped her twice in the head and shot her in the face, Yarbrough said she ran from his apartment and burrowed in some bushes behind the building to hide. Yarbrough said she used to live in the four-unit apartment building where the shootings occurred and was acquainted with May and the people living next door to him, including Jones. The night of the shootings, she was walking home from the grocery store and stopped to see if May could give her a ride the rest of the way home. She sat down with May in his apartment, talking cordially and having some cake with him. At one point she went outside and one of the neighbors asked if she had methamphetamine, Yarbrough said. Yarbrough said she didn’t have any drugs on her, but May told her she could take some of his meth to the neighbors in exchange for $20. In front of May, she folded some in a paper towel and took it next door, Yarbrough said. When she returned to May’s apartment, he accused her of taking too much and became enraged, she said. She said May cornered her, pulled a pistol from the back of his waistband and hit her over the head twice. From down on the floor, now in fear for her life, Yarbrough said she looked up at May. “I begged him to please stop. I asked him to please pray with me. I asked him in the name of Jesus, Tommy, please don’t do this,” Yarbrough said, tearfully recalling the attack. In addition to the scars, the shooting left Yarbrough with “a slight tilt” to her face, she said. She got staples in her head where she was pistol-whipped. She said bones in her shoulder were shattered, and bullet fragments remain there. She said she has nerve damage on her left side and has lost motor skills in that hand. Jones did not show up in court voluntarily. When he failed to appear for the hearing in the morning, the judge issued a material witness warrant for him and sent deputies to find him and bring him in. Jones rolled into the courtroom that afternoon and told the judge he was not willing to testify. “I was under the influence of drugs, and I really don’t recall everything that happened,” Jones said. McCabria ordered Jones arrested and held on $15,000 bond until he was needed in the case. He appointed Jones an attorney, Joshua Seiden, and told Seiden he would consider releasing Jones on a personal recognizance bond if he could be assured to show up next week. Testifying separately on Tuesday, Jones’ girlfriend Micki Ryan and a friend who was visiting that night, Regina Gay Sailor, both raised their right arms out straight with fingers extended like a gun to illustrate what they saw May doing when they looked outside after hearing the first shot followed by Yarbrough’s screams. Both women said they saw May shoot Jones. 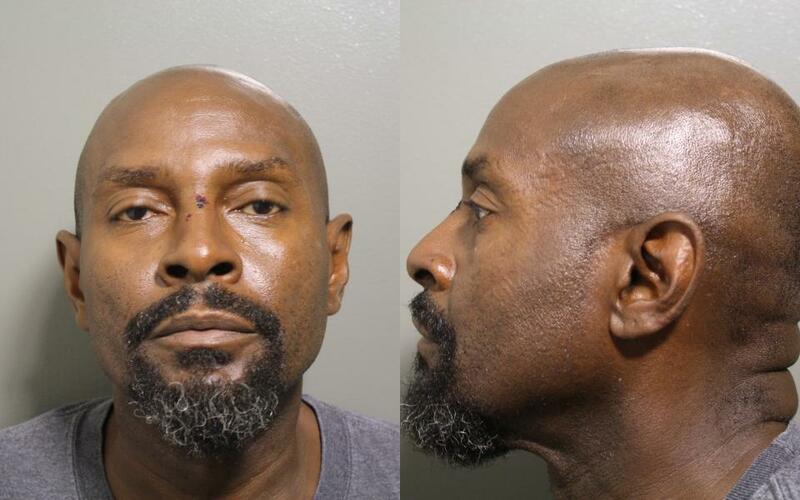 Police were dispatched to the shooting with a description of the suspect who fled the scene afterward — a bald black man driving a green 1990s-model GMC Jimmy. As he headed for the scene Sgt. Robert Neff was on the lookout for the suspect. Neff did spot the green SUV and followed it eastbound on 23rd Street in hopes of getting close enough to read the license plate, he said. When the SUV sped up instead, Neff activated his lights and sirens and chased it at speeds he estimated at 80 miles per hour. At 21st and Louisiana streets, the SUV veered off the road, knocking down a fire hydrant and getting high-centered on it. In Neff’s dash-cam video, the SUV revs its engine and spins its tires, rocking and sending smoke or dirt flying, as Neff yells orders. A vehicle sits in the middle of the street with the driver’s door open just east of 22nd and Louisiana Streets on Monday, July 2, 2018. 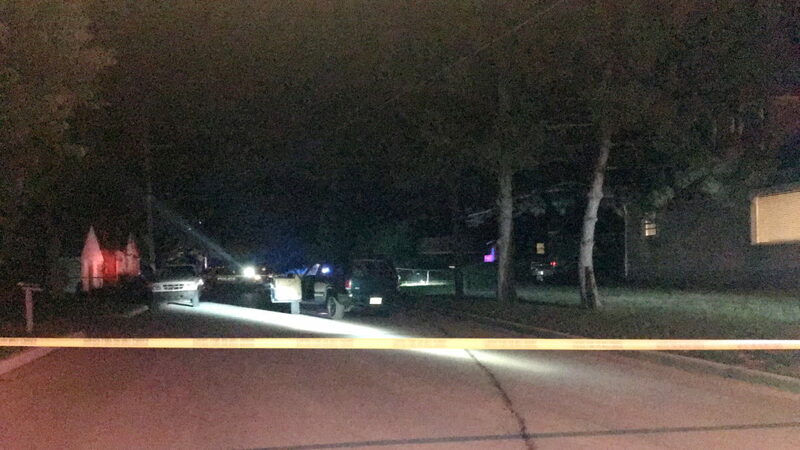 A shooting was reported in the area that evening, and 22nd Street was closed and roped off with police tape. Suddenly, the SUV frees itself from the hydrant, lurches backward and continues until it rams the front end of Neff’s patrol car, leaving the camera’s view. 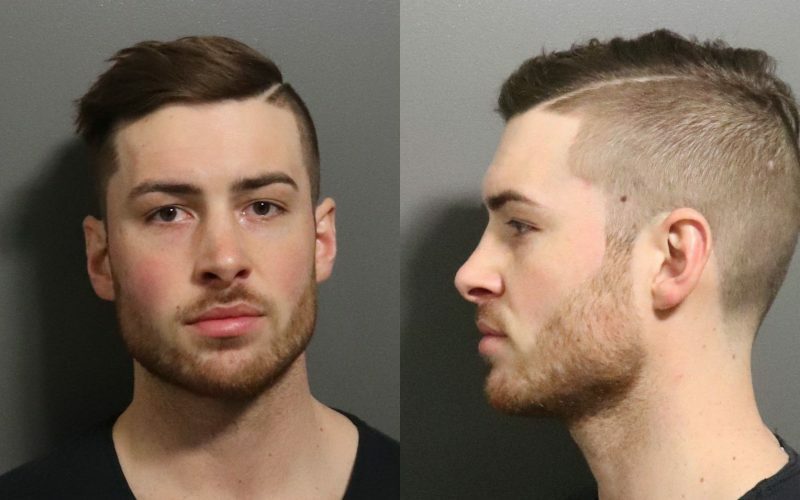 Neff testified that when the SUV was coming at him, he ran to a spot about 15 feet behind his patrol vehicle, but then the SUV switched from reverse to drive and accelerated straight for him. In the video, three bursts of gunshots can be heard amid screeching tires and banging sounds. Neff said he fired several shots at the SUV before the front of the vehicle hit him. He fired some more as his body hit the hood then rolled off onto the pavement, he said. Almost instantly, he said, he jumped back up, ran after the SUV and fired some more. “I wanted to catch him, stop him,” Neff testified. When he’d emptied his magazine, Neff reloaded, he said. Then he looked down to make sure he was all in one piece; besides an injured elbow and some road rash, he was. He then ran a block south to where the SUV had crashed again. Other officers found May on foot several blocks away. In Neff’s dash-cam video, the SUV’s driver can be seen throwing something out the passenger window before backing into Neff, but Neff said he could not see that action in the moment, only later on the video. Police recovered a handgun in the grass at that location. The sergeant’s use of force was investigated by an outside agency, separately from the Lawrence Police Department’s investigation into the double shooting. After reviewing the Kansas Bureau of Investigation’s probe, DA Charles Branson announced in September that he was clearing the sergeant.